Today I attended the 5th Annual Lawyers Lend A Hand My Hero Awards Luncheon. More than 200 lawyers, judges, business people and leaders of Chicago tutor/mentor programs attended. The event honored the memory of Judge Abraham Lincoln Marovitz, and celebrated how members of the legal community were supporting volunteer-based tutor/mentor programs in Chicago. I've written about the Lend A Hand many times since 2005. I sat at one of the back tables and enjoyed listening to Merri Dee, formerly of WGN TV, as she did her duties as Mistress of Ceremonies. This photo shows me and Merri Dee at a Tutor/Mentor Leadership Networking Conference in 1995 or 1996. 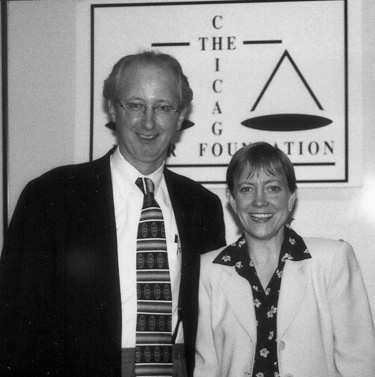 We were funded with grants from WGN TV Children's Charities until 2001. The first time we met she gave me the "If it is to be, it is up to me" slogan that I still use today to motivate my actions. It was also a pleasure to here the work that the new Executive Director is doing to lead the Lend A Hand Program. This picture is of myself and Betsy Densmore, who was Executive Director of the Chicago Bar Foundation in 1993-94 when Lend A Hand was created and when Tutor/Mentor Connection first suggested a partnership that would "support the funding of general operations of tutor/mentor programs throughout Chicago." I really enjoyed seeing Michael Chabraja of Family Matters receive the Making a Difference Award. This was presented by Devon Lovell, who has been a workshop presenter at many T/MC conferences. Devon told of Michael's journey from becoming a volunteer to being elected President of the Family Matters Board of Directors last weekend. 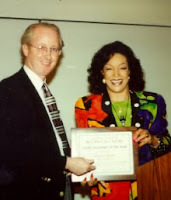 This photo shows a representative of Family Matters receiving a Lend A Hand Award at the Spring 1998 Conference. Tutor/Mentor Connection was not on the agenda today, but it felt good watching the ceremony, knowing the role we have taken since 1993 to help this organization grow to its current level of support for tutor/mentor programs. However, what was not said is what I want people to think about. LAH grants range from $5,000 to $10,000 which is about 5% of the Cabrini Connections budget and much smaller for a larger organization like Midtown Education Foundation. The 30 programs receiving grants are a small percent of the 200 that are in the Program Locator Directory. The Tutor/Mentor Connection heaps praise on LAH because of what it does, and what it has the potential to do. The lawyers represented in today's gathering represent huge wealth in Chicago. The can do much more to raise money, and provide direct funding, to all of the programs LAH currently funds, and many others who are on the T/MC directory. Furthermore, they can do much more to influence what banks, accounting firms, engineering firms, construction companies and others do to duplicate LAH in their own industry, so that funding for tutor/mentor programs comes from multiple directions, and the total funding each year comes close to 100% of the operating expenses of most of these programs. Our goal is that businesses use maps like these to build strategies that distribute volunteers and donors to more places in the city where they do business, rather than to one, or two, choice organizations. When the Hon. Mary Ann G. McMorrow ended her Judge Marovitz Mentoring Award acceptance speech today, she talked of the message greeting visitors to Harvard University as they entered campus and how the memory of your deeds and actions live beyond the span of a lifetime. 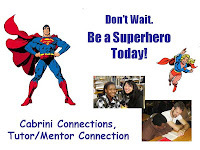 I feel good about what I and Cabrini Connections, Tutor/Mentor Connection have been able to do since 1993. I feel that we could have done much more if we'd been able to keep supporters like Montgomery Ward & Co and WGN, or find major benefactors from among the wealthy families in Chicago. Yet, I'm uplifted by what I saw today, and hopeful for what we can accomplish tomorrow and in the future. We can do this if more of you take Judge Abe's advise and "do a good deed" every day. Point some of those to helping tutor/mentor programs and you can get one of these awards for yourself in the future. Or you can sit in the back of the room with me, feeling good about what you know you've done. Today's Chicago Tribune uses the front page to shout about poverty rates in the Chicago region. For readers who are concerned about poverty, and the growing gap between rich and poor, it's difficult to use the web sites of the major media to do research. Their feature stories keep changing, and the archives are not intended to support efforts of citizens who want to take ownership of the future of the Chicago region. That's why we created the Tutor/Mentor Connection (T/MC). 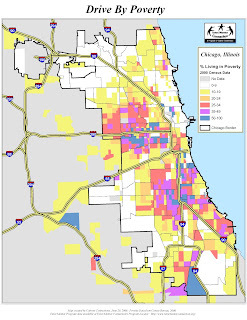 We use maps like this one to show where poverty is most concentrated in the Chicago region. We post these maps in this blog, and on the Mapping for Justice blog. While we struggle to find donors to help us maintain our own map library, we also point to web sites of others who are using mapping to show where poverty is having an impact. In addition, we share these maps and our ideas in other forums, such as Fireside Learning. And from these forums we add new links to our learning library, where anyone who reads today's Tribune can go, and dig deeper into information that helps them understand the impact of poverty on schools and economic growth in the region. Here's an article titled Economic segregation rising in US public schools While I'm sharing this via today's article, I also post it in this section of the library, so it's available tomorrow and beyond, for researchers, activist, foundation leaders, and anyone who is motivated by an article in the paper to want to do more. We hope that some of those politicians who want to be the next Mayor, Governor, Congressman or even President will learn to use this library for their research and decision support. I also hope that some of those reading this will see the value of the Tutor/Mentor Connection to Chicago, and will step forward as champions and benefactors so we have funding to do this work. Inner City Violence - "its not just in Chicago"
I attended a memorial and community resource fair on Saturday at St. Sabina Church, on the South Side of Chicago, near Racine and 79th Street. You could have read about it on the front page of Saturday's Chicago Tribune, and again in today's Tribune. It was a moving ceremony, with bells rung for each of 78 young people killed this year and with mothers of Derrion Albert and Lazarus Jones and police officer Thomas Wortham speaking to the audience of over 300 people. I have seen Rev. Dr. Michael L. Pfleger in the news many times, but this was the firs time I've been to his church. I was one of about 40 community based organizations sharing information at the resource fair. During the service, Fr. Pfleger said "It's not going to stop until we make it stop" and then he added, referring to the Mayoral election "Don't give money to anyone who doesn't have a track record working to end violence or improve schools." I wish I had had a chance to talk one-on-one to Fr. Pfleger. I would have showing him the maps and the map gallery, and illustrated how political leaders can use these to mobilize and distribute resources to tutor/mentor programs in their districts. I did not get that chance on Saturday, but hope others who want to end violence, will take a look at the way we are using maps. Over the past 12 years my knowledge has dramatically expanded because of the way I've been learning from the work other people do all over the world. In many cases, I've been able to re-define my own work when I've hear more articulate writers describe what I do in their own essays. I ask all of our staff, volunteers and interns to learn from the information on our web sites so they can build their own understanding of our vision and strategies and be more able to communicate this to people in their own networks. I encourage them to write blog articles to share their growing understanding. Karina Walker joined our staff as a Public Interest Fellow from Northwestern in July 2010. Here's what she wrote about the Tutor/Mentor Connection vision and purpose today. I hope you'll read this and use it to expand your own understanding. I'm on Facebook, but I doubt that Mr. Zuckerberg has ever visited the Cabrini Connections, Tutor/Mentor Page, or read this blog. If he did, maybe he would see the graphic I included with the Waiting for Superman article I wrote earlier this week. Mr. Zukerberg could divide his $100 million three ways. 60% could go to schools. 25% could go to after school programs that fill the 3 to 5pm time slot. 10% could go to tutor/mentor programs that operate after 5pm when workplace volunteers are more available, and 5% could go to someone who operates like the Tutor/Mentor Connection, and provides maps and a directory, and a library of knowledge, that would help him and other donors make sure they are distributing money, volunteers, technology and other needed support into all of the neighborhoods of the Newark area with high poverty and poorly performing schools. If he want so support the same strategy in Chicago he could give some of that 5% to the Tutor/Mentor Connection since we've yet to find this type of support from Chicago millionaires. This press release shows who won Promise Neighborhood planning grants, which were announce this week. 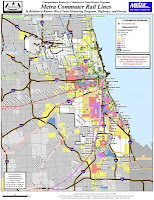 This article shows how T/MC offered to help Chicago organizations and others with their planning grants. 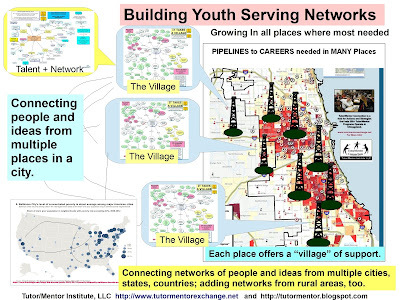 These collaboration ideas show how T/MC maps, web strategies and ideas could still be used to create neighborhood networks supporting the birth-to-work journey of inner city kids. We'd like to help. We'd like some benefactors to help us. Call 312-492-9614 or introduce yourself on our blog. When we launched the Tutor/Mentor Connection and the first Tutor/Mentor Leadership and Networking Conference in spring of 1994, there was no "national mentoring partnership" and many of the state and city partnerships that now exist were not in existence. We held a conference every six months to keep attention focused on tutoring/mentoring and to bring together people who had time to meet and share ideas. We built a web library of information that any one in the country could draw from. 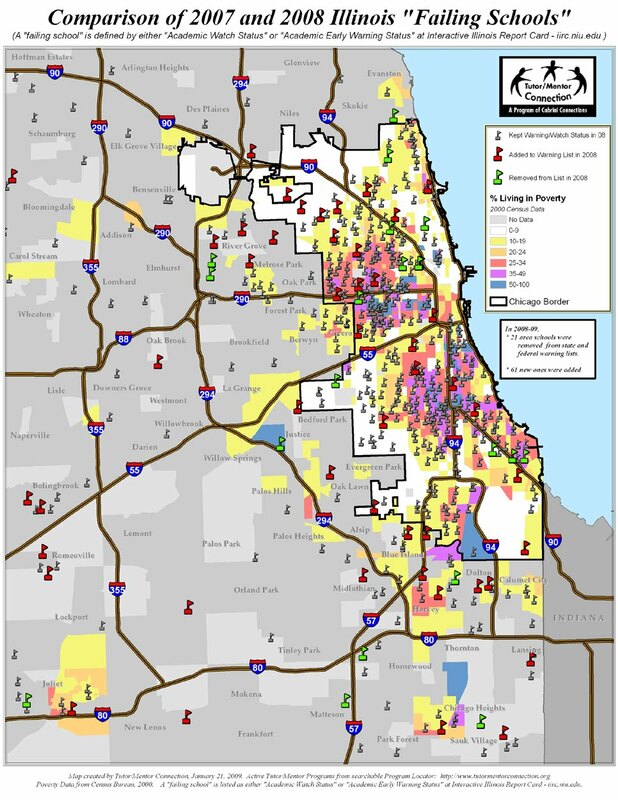 We focused all of this on the database of Chicago tutor/mentor programs, and maps, that point to where tutor/mentor programs operate, where more are needed, and who should be helping because they do business or have a role in that zip code or neighborhood. Now there are conferences in Michigan (Nov 17), Minnesota, Oct. 25; California (Jan 10); New Mexico, Oct 27-29. We share information about all of the mentoring conferences we learn about on this link. With so many competitors, finding sponsors to keep the Tutor/mentor Connection and conference in Chicago funded has become more and more difficult. We still have not located donated space for the November conference. We don't have donors funding the map based Program Locator so we can keep upgrading the technology. Yet we've been contacted by people from different states, and from the Chicago region, asking to do workshops, or for attendance information. Will this growth in networks be to the benefit of all of us, or the reason most of us fail in what we're trying to do? I think it's a good thing that others are hosting conferences in different places. More people can attend, and we raise more visibility for tutor/mentor programs. However, I wish every conference would point to each other and that every conference would point to on-line forums where people who attend, or can't attend, can talk to each other. 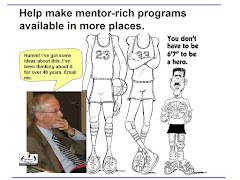 The Tutor/Mentor Connection on-line forum is here. Finally, I would like to see more of those hosting conferences, being more aggressive and innovative in using them to point volunteers and donors directly to the volunteer-based tutor/mentor programs operating in their communities. If we all do this, and link to each other, we can influence more year-end donors to seek out tutor/mentor programs in each city and state. Without pushing the operating dollars to the programs how can the programs use all of this training and networking that the conferences offer? The Waiting for Superman documentary hits theaters this week. Today a discussion is taking place on Oprah. These discussions focus on fixing schools. My goal is to add another level to this discussion, where we talk about what we can do in the non-school hours, in high poverty neighborhoods, to help kids expand their aspirations, expand the network of adults who are helping them through school and into jobs, and help more adults become personally connected in the lives of kids in poverty. This means that we need to focus on schools, and non-school learning centers, and focus volunteers and donors on both tiers. It means we also need to think of the non-school hours in two time frames. One is right after school until parents come home from work. A second is after five and into the early evening when workplace volunteers might be able to spend a couple hours a week in a tutor/mentor center working with kids in poverty neighborhoods. I have not found a place on the Internet where a discussion of non-school tutor/mentor programs is taking place, and where donors and business leaders are involved. That means, the Superman focus will be much narrower, and perhaps have less long-term impact. You're welcome to join the Tutor/Mentor Connection on Ning to share your ideas, and learn from ours. Or, if you know of a place hosting the type of ideas we talk about on this blog, just share the link, and we'll join you there. Since 1975 I've been building a database of people who operate tutor/mentor programs, people who do research, people who provide funding, etc. This is the "village" of people who need to be working together to help inner city kids move through school and into jobs. Since 1994 we've been doing this through the Tutor/Mentor Connection. In May 1994 we used the database to invite programs to come together for a conference, to share information, network and build stronger businesses of tutoring/mentoring. We've been doing that every six months since then. We've not had much help because it's hard to demonstrate the value and impact of what a "network builder", especially when there is almost no money available to fund the T/MC on a regular basis, and we're in the third largest city in the country. 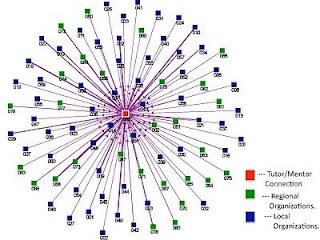 In the past year we've been learning to use Social Network Analysis software donated by Valdis Krebs of Orgnet.com. We've had no money for staff, so volunteers have been doing this work. You can follow the progress here. One of our volunteers, Kalyani Misra, has created maps showing participation in the May 2008 Conference. She posted these maps on a Social Network Analysis blog that she has created. Here's one of the maps that Kalyani included in her blog. I encourage you all to read the blog and offer comments either on the blog, or in SNA work space forum. 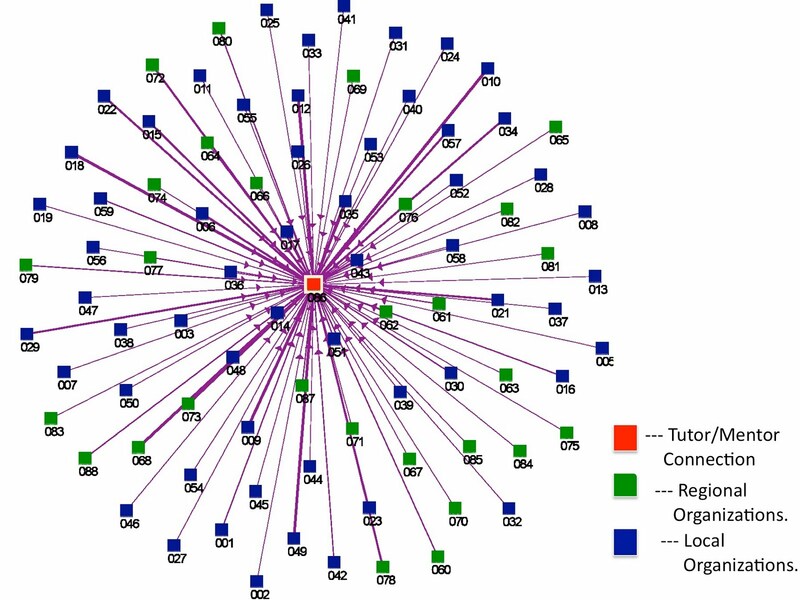 The map shows that because the Tutor/Mentor Connection makes an effort to maintain a database of tutor/mentor programs and related organizations, we can send an invitation that invites people to come together to share ideas. Because we make an effort to organize the May and November conferences, funded by our own volunteers and leaders, and small fees from some of the conference participants, we make it possible for this group of people to connect. Below is a different way to look at this information. 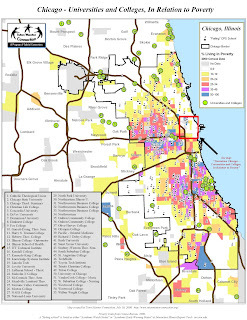 This is a map of Chicago showing locations of Chicago based organizations who participated in the conference. With the information now available, we can show how all of these organizations are connected to T/MC. 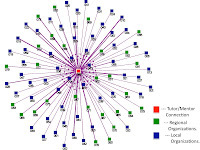 With future surveys of conference participants, we can show how the participants are connecting to each other, as a result of attending the conferences. We can also build an understanding of how strong the networks are for each organization, and hopefully help each group strengthen those. If this is used in combination with the GIS maps, we can help programs see what other programs, and assets are in the same zip code, or section of the city. With this information anyone can begin to submit invitations for people to meet at the T/MC conferences, and in smaller neighborhood collaborations in the months between conferences. When we launched the Tutor/Mentor Connection (T/MC)in 1993, we realized that we would need to engage the resources of universities and their alumni. 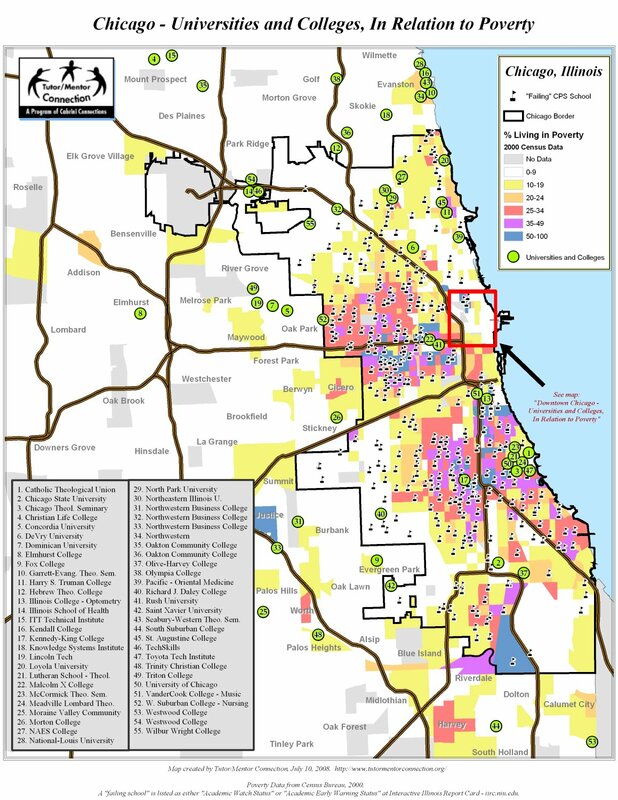 This map shows locations of colleges and universities in the Chicago region. In 1993 when I talked about getting universities involved, a researcher at the University of Chicago thought I was crazy. "If you think you can get universities to work together" she told me, "maybe all of your other ideas are invalid, too." I never claimed I could get universities, or the people within single universities to work together. However, I have been working to get some people in each university to work with the T/MC, and to engage their resources to help volunteer-based tutor/mentor programs grow in different parts of the region. If groups from different universities are building knowledge libraries, and working to engage university an alumni resources to help volunteer-based tutor/mentor programs grow in the neighborhoods of their universities, we can host that information in the T/MC library, and invite representatives from each school to share what they know at the conferences we host each year. In other words, we can facilitate the exchange of ideas and information, and help each university grow in its role. If a small non profit can do this, teams at any of these universities can do it better. This strategic plan for University ownership of a Tutor/Mentor Connection strategy was created by graduate students from DePaul University 10 years ago. The T/MC web site was created in 2005, and is hosted, by IUPUI in Indianapolis. This is a slow process, because it involves building relationships, and building ownership. One group that I'm working with is a first year "coming to Chicago" class at DePaul University. Last fall, Janet Hickey approached me with a goal of doing a project with my organization. I suggested a research project, where the students use T/MC maps and program locator to build their own understanding of poverty, and the availability of tutor/mentor programs. That 2009 project is described here. Today, we will launch a 2nd year of this project. The class goals will be posted on this web site, along with links to student blogs. You can see them on this PDF. Instead of just repeating what was done in 2009, this group will build upon that, to understand the way tutor/mentor programs are funded. 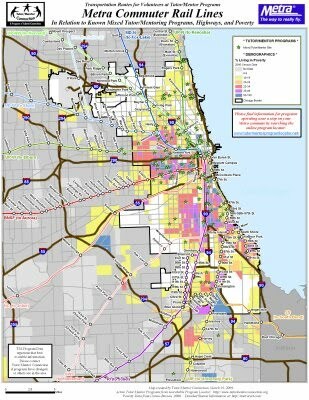 As they share this information via blogs, we hope it leads to others from DePaul, and other universities, to take on similar strategies, that ultimately lead to new ways to support the growth of high-quality "mentoring to career" programs serving youth in all high poverty neighborhoods of the Chicago region. Follow the progress of this group of students over the next three months. Visit the blogs on the T/MC forum and see how other students and alumni of other universities are doing similar work. Join in. This is a strategy with room for many leaders. We hope teams will come from every university, and from the business community, where their alumni are working and leading companies. I’m a Bears fan. However, I really felt bad for the Detroit Lions yesterday. If you did not see the game, a last minute, game-winning touchdown pass was ruled “not caught” because the ball came out of the receiver’s hand when he was getting up after making a great catch. There was not doubt among announcers, fans and myself that this was a real catch. However, the rule says you have to come down with the ball and secure it. Watch the film. Why am I writing this? Because many of the rules of philanthropy are just as frustrating. Most companies fund in cities, and zip codes near where they have facilities, not where they do business. Many foundations limit funding to 1, 2 or 3 consecutive years, meaning non profits are constantly searching for new donors, and often shifting mission in order to find those donors. Maybe there are good reasons for these rules. However, I think that in some cases the rules need to be revised. The Tutor/Mentor Connection (T/MC) web site is visited by people from different parts of Chicago, and from many different states and countries. Everyone is able to use our ideas and information to innovate ways to help youth in their own parts of the world. If the idea benefits programs in Washington State, why shouldn’t Microsoft be willing to find it? If it benefits youth in India, why shouldn’t companies or donors from India support it? Companies outsource business processes such as manufacturing to other parts of the world, why would they not support good ideas from non profits, that benefit people in their own business areas, or in places where they do business… regardless of where that non profit is located? Maybe this makes a difficult job of deciding who to give donations to even more difficult, but maybe more good ideas get the funding they need to solve some of the difficult problems facing the world. However, if we expand our donor base, we do a better job of providing our services, and everyone benefits. Obviously, this would only be true if the services offered really do benefit people in many different places. I contend the ideas and resources on the www.tutormentorconnection.org site do offer befit in many places, not just in Chicago. The second challenge is the decision to limit grants to one, two or three-year cycles. This is not just a practice of government and grant-making foundations, it’s also a practice of individuals, and giving circles. People with good intentions select a charity and give a donation. Then next year they select another charity, and give them a donation. Foundations fund a non profit for a short term, then based on rules, or guidelines, they cease their funding. Just like the football rule, there is a reason for the rules of philanthropy, such as not wanting a non profit to become too dependent on a single donor. Or wanting to provide help to a wider range of causes. However, if we want to solve complex problems, such as helping kids born in poverty move from first grade to first job, we need to find ways to provide consistent, year-to-year funding of programs that work with these kids for multiple years. Imagine giving birth to your own children then after three years saying “go find another set of parents because my guidelines say I can’t raise you any longer”. That’s just about what the philanthropy world, and those donors who choose a different charity every year, are saying to organizations trying to help inner city kids move from birth to work. There’s an assumption that we all are great fund raisers, when that’s not true. We don't all have the same networks, or the same high powered volunteers in our leadership. Yet, our maps show that good tutor/mentor programs are needed in all poverty neighborhoods. The expectation should be that non profits do great work with the money that is provided by donors and leaders who share the same vision and goals as we do, and who work just as hard as we do to make sure good programs are available in all of the places where they are most needed. As we start this 18th year of Cabrini Connections, Tutor/Mentor Connection, I hope there will be people who look at our web sites and share our long-term commitment to helping inner city youth through school and into adult lives, and who will make it their mission to make sure we have the money and other resources needed to be a world-class organization in achieving this mission. The front page of Friday's Chicago Tribune featured a story on failing Chicago Public Schools. When I went to look for the story today, I had to do a search to find it. That's the one of the problems facing us as we try to mobilize more people to work together to help inner city kids have the wide-range of adult supports needed to move through school and into jobs. We can't keep people focused on this problem from day-to-day. We don't have the advertising/PR dollars to do this, and the media keep moving to different stories. You really need to know what you are looking for to use the media web sites to search for information on a particular problem. The media occasionally use maps. We'd like to see them always use maps when talking about poorly performing, or well performing, public schools. We'd also like to see them link to our web sites, so readers can go beyond the bad news, to find places where they can become volunteers, donors, students, in existing tutor/mentor programs. In many cases there are no tutor/mentor programs. That means the first role of some people looking at these maps, is to mobilize others who would work together to create new programs. At the same time, the role for most people is to find ways to help existing programs get the on-going, flexible funding and volunteer resources needed to constantly improve what they do. You can always read about this on the Tutor/Mentor Connection blogs and web sites, even if the newspapers don't use maps, or point to us in their own stories. This is a second video created this summer by video club teens and volunteers at Cabrini Connections, a non-school tutor/mentor program operating in Chicago. Yu-Gi-Oh! Final Battle - Music Video from Cabrini Connections on Vimeo. This Back to School blog written by Karina Walker of the Tutor/Mentor Connection, illustrates how we share what we learn at Cabrini Connections with leaders and volunteers in tutor/mentor programs operating throughout the Chicago region. 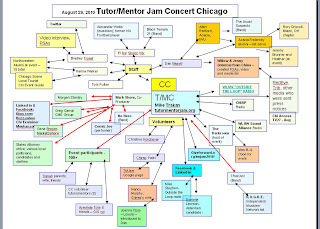 On the Mapping for Justice blog, Mike Trakan of the T/MC shows how we use maps to focus volunteer and donor attention on all of these programs, and how we organize events, like the Tutor/Mentor Jam concert, to try to draw more attention to tutor/mentor programs. This is made possible by donors who make large, and small donations to fund our work. Please read this appeal, and add your own support. Daley Departing. Can Next Mayor Do Better? Yesterday's announcement that Chicago's long-term Mayor Richard Daley will not run for re-election has created quite a buzz, and I'm sure it will be the main topic of media for the next six months. Bigger than the Olympics. Bigger than 9/11 ... at least for Chicago. I'm not writing to bash Mayor Daley. He did a great job for Chicago and does not need my praise to have his place in history. However, I do wish we had found ways to connect strategically. I first met the mayor in 1990, when he visited the Cabrini Green Tutoring Program, which I helped create that year. It originally was the Montgomery Ward-Cabrini Green Tutoring Program, started by Ward employees in 1965. I joined it in 1973 and became it's volunteer leader in 1975. Thus, by 1990 I had 15 years experience. You'd think the new Mayor would want to draw upon that. 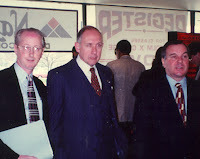 I met the Mayor again in May 1997, when he attended the Tutor/Mentor Leadership and Networking Conference, the month after the President's Summit for America's Future was held in Philadelphia. 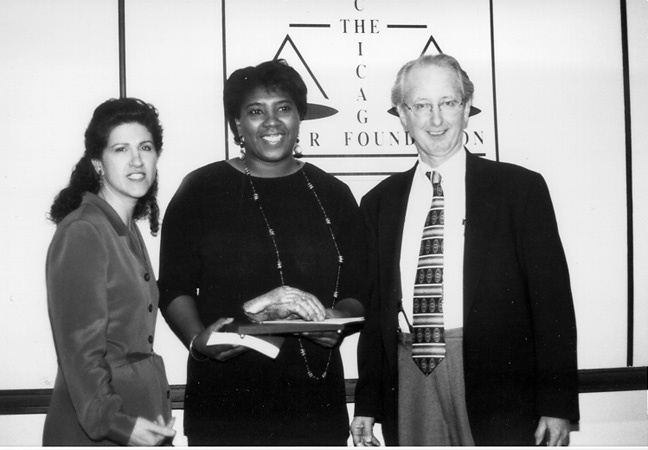 In 1994 I began working with the Lend A Hand Program at the Chicago Bar Foundation, and each year until 2000, the Mayor signed a proclamation, calling for a Tutor/Mentor Week in November, to draw attention to efforts to help volunteer-based tutor/mentor programs grow in all neighborhoods of Chicago. Here are the proclamations from 1995 and 2000. In 1995 the T/MC launched a volunteer recruitment campaign. Our first partner was Chicago Access TV, who has posted information like this on their web site every year since then. 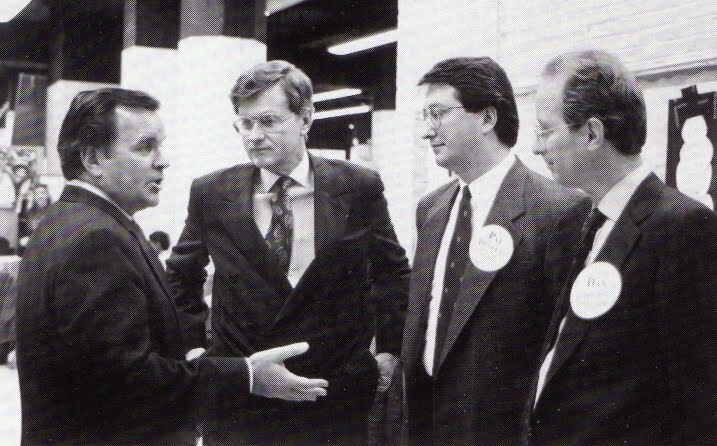 By 2002 the campaign was including more than 100 youth organizations and the campaign proclamation was signed by the Governor, and Mayor Daley. Here is the 2001 Campaign Manifesto. However, these shows of support have not translated into city wide strategies to connect business volunteers and resources with tutor/mentor programs in many neighborhoods. Instead of supporting the Tutor/Mentor Connection, the Mayor's wife created Afterschool Matters. Instead of supporting non-school tutor/mentor programs, the Mayor's office supported charter schools, funded by private sector donations. 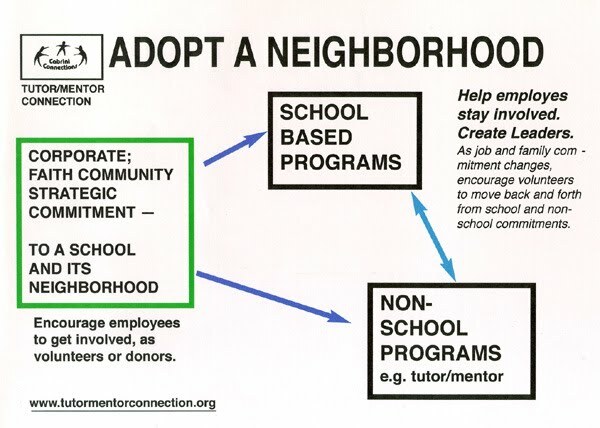 Instead of an adopt a neighborhood strategy, there is an adopt a school strategy, which leaves the neighborhoods without a full range of high quality non-school learning, and mentoring programs. I don't blame the Mayor for this. I recognized when we formed the T/MC in 1993 that elected leaders are controlled by the everyday events that pull them in different directions. Our own organization started with no money in 1993 and grew each year, with the backing of the Montgomery Ward Corporation, and the dot-com bubble, until 2000. We were able to grow the volunteer recruitment campaign because one donor made gifts of $26,000 per year to fund a staff person for four consecutive years. However, Wards went out of business in 2000, and we lost donated space, and $40,000 per year in funding. The dot-com bubble bursts, and 9/11 came. The donor who funded the recruitment campaign changed funding priorities. At the same time, the partnership with the Lend A Hand Program that had resulted in the annual Mayor's proclamation and support of a November Tutor/Mentor Week, began to diverge as they begin to shape their own direction and strategy for supporting volunteer-based tutor/mentor programs. Thus, there is no top-level leadership strategy in Chicago aimed to support ALL tutor/mentor programs throughout the city by helping each program get the operating and innovating resources, including dollars, that each program needs every week to be great at connecting youth and mentors and learning. Thus, Cabrini Connections, Tutor/Mentor Connection has been struggling to keep its own program in place, and support the basic information collection and sharing that we do. We've not had the manpower or resources since 2000 to reach into the Mayors office and engage his leadership to support the growth of tutor/mentor programs that help mentor kids to careers, has not been strong enough to compete with all of the other people and organizations calling for the Mayor's attention. Yet. If helping kids in all neighborhoods move through school and into jobs and careers is a priority, I would hope that some people in the Mayor's office, in the past, or in the future, would be doing their own research to learn what ideas they might apply to this problem. All they need to do is search Google for "tutor mentor" and they would find our web sites and our contact information. This is true for anyone else who wants to share this vision. While we and other tutor/mentor programs are looking for volunteers, donors and benefactors, the Internet now makes it possible for elected leaders, CEOs and anyone else to look for ideas that they can incorporate into their own actions. 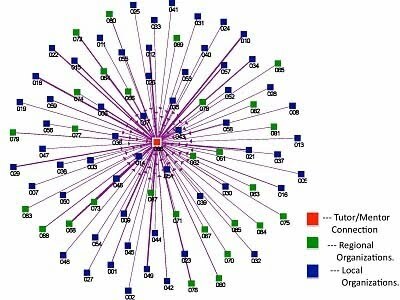 The don't need to look far to find the Tutor/Mentor Connection and to learn what we do based on the information we share on our web sites. If we're heading in a direction that you can support, you don't need a proposal from us, you need to decide how, and how much, you want to help, then give us a call, or send us your donation. 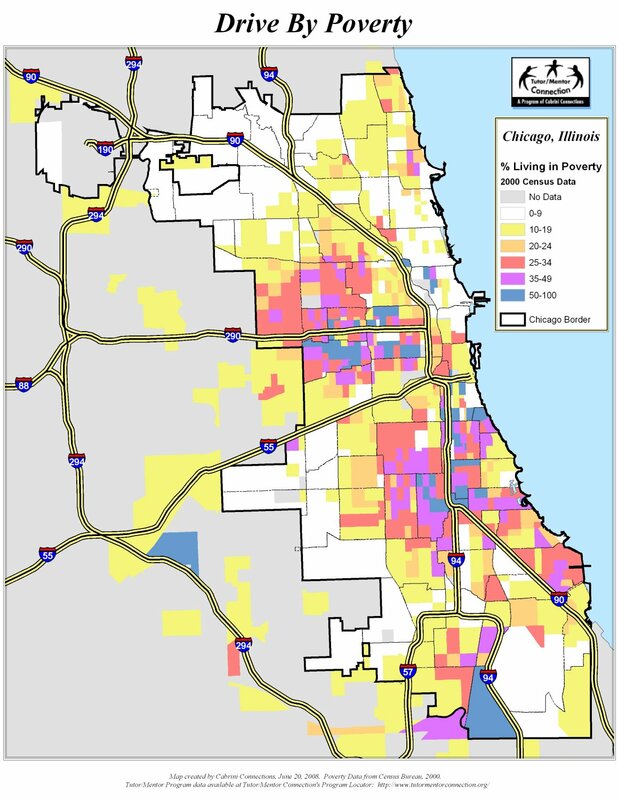 Using the Tutor/Mentor Program Locator, you can shop and choose programs in many parts of the city to offer help, and you can see that many neighborhoods do not yet have programs. Your help in those cases would be to bring people together to build a team that would start new programs. Anyone who wants to be the next Mayor could demonstrate this leadership over the next six months. Share what you do on a blog or web site, and in the media coverage you will get, and voters can choose the next mayor based on what he/she will do every day to help ALL kids in Chicago have great opportunities for bright futures. This video created by Unted We Learn, provides an emotional appeal to fix the education system in Illinois. This is the short version. A longer version link can be found on the web site. Short UWL video from United We Learn on Vimeo. 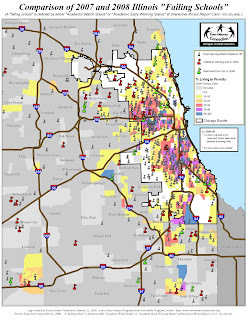 Tutor/Mentor Connection uses maps, like this one, to focus attention on all of the high poverty areas of the Chicago region. We host an interactive map, where you can zoom into a zip code, and find contact information for non-school tutor/mentor programs that may be in that neighborhood. The focus on school funding is needed, but let's not forget the community wealth that is so much greater in affluent communities than it is in inner city neighborhoods. You could double the dollars per student and still not come close to matching the influences that kids bring to school with them every day in New Trier and similar places. That's why we focus on non-school tutor/mentor programs. It may take decades to make inner city schools as good as suburban schools. However, we can provide much of the mix of learning, enrichment and mentoring by college educated people, through non-school tutor/mentor programs. Furthermore, in those non-school programs with technology embedded in their strategies, mentors can guide kids to learning far beyond what is available to them in their local schools. Mentors and tutors can help stretch the learning opportunities, and the aspirations, helping kids come to school ready to demand more from their teachers and classmates. However, without a consistent flow of operating resources from the wealthy suburbs to inner city tutor/mentor programs, none will be as good as this vision, and many neighborhoods will not only have poor schools, but will have poor learning and support systems in the non school hours. I hope movies like this, and Waiting for Superman, motivate more people who have been blessed by where they were born, to become personally involved in one, or many, non-school tutor/mentor programs, and begin to look for ways to help kids now, rather than wait for the school system to be fixed. Since school starts tomorrow in Chicago (my kids started a week ago) this article about study skills is pretty relevant. Thank you http://twitter.com/CareForKidsOrg for bringing this to my attention. 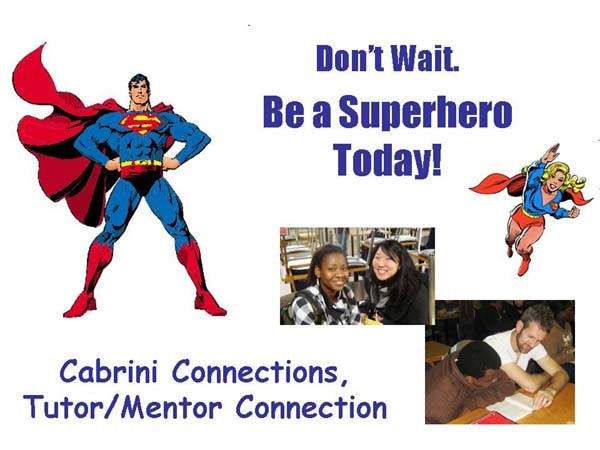 The Tutor/Mentor Connection and Cabrini Connections offer opportunities for many people to contribute their time, talent, and dollars to help inner city youth move from birth to work in 21st century jobs and careers. This benefits young people, and it benefits corporate America. Not everyone serves as a tutor/mentor. Many are reviewing the ideas I've posted, and writing new articles to help others make sense of this information. Michael B. Romain is one of those volunteers. On our Ning site Michael is beginning to post articles showing his growing understanding of our mission and the information we share. Here's an article he posted this week. Visit the Cabrini, T/MC Fund Raising blog to read Tutor/Mentor Jam stories showing the fun, and fund raising made possible by many people. 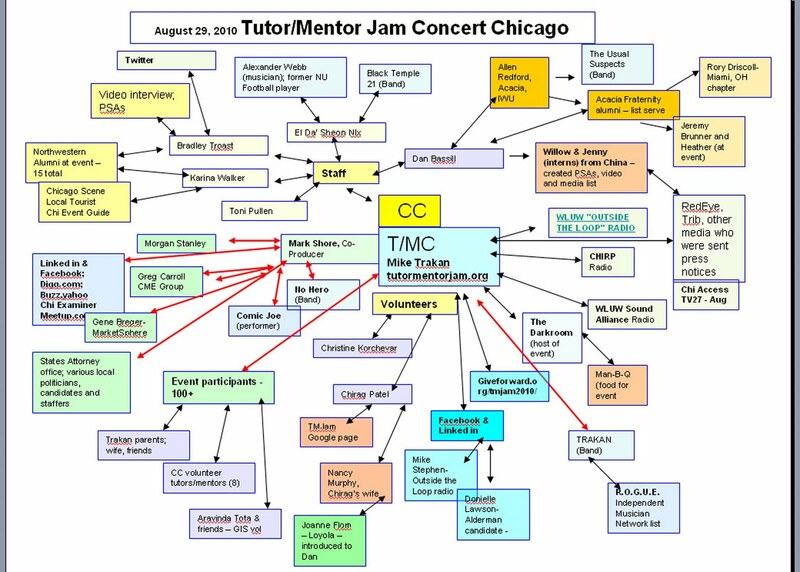 This picture shows how Mike Trakan's initiative in organizing the Tutor/Mentor Jam resulted in dozens of new connections for Cabrini Connections, Tutor/Mentor Connection, and new friends who may become major supporters of mentoring and tutoring in the coming months and years. We organize events throughout the year at attract attention for tutoring/mentoring and to recruit volunteers and donors to support programs. Martini Madness will be held on October 1. The next Tutor/Mentor Leadership and Networking Conference will be in November. Add your own name to this networking map by helping us connect with new friends and supporters. It takes a village to raise a child, and it takes the effort of every person in the village to make this happen. With the college football season starting this week, and the NFL starting the following week, most of the work of preparing for the season is in the final stages. It's time to put the team on the field and see who wins. I encourage you to read the Coaching Clinic article that El Da'Sheon Nix, Administrative Coordinator, and Head Coach, of the Cabrini Connections tutor/mentor program, wrote this week. He compares the work he is doing with our volunteers, to the coaching clinics that college, professional and high school coaches attend each year, to learn new ways to make their teams successful. The graphic on this page shows the organizations who participated in the May 2008 tutor/mentor leadership and networking conference. This is a "coaching clinic" for leaders of tutor/mentor programs in Chicago and other cities. It serves the same purpose as the sports clinics. It's aim is to help every program get better, and every city have a better distribution of programs. Sports teams have wealthy owners, and wealthy boosters. They have millions of fans to buy tickets and sports merchandise. Tutor/Mentor programs don't have that fan base, nor do they have wealthy investors. Yet, the team they put on the field is critically important to the business owners who invest in sports teams, and to Democracy in America. We're looking for investors to help us offer the Tutor/Mentor Leadership and Networking Conferences. If you value what sports clinics do for your favorite football team, help us offer this type of support to tutor/mentor programs in Chicago and other cities. If you'd like to follow our progress on mapping the network being created by the Tutor/Mentor Connection, visit this site.